This entry was posted on September 15, 2012 by Boyd Specialty Sleep. Ironically, even at the height of their popularity, waterbeds were never associated with sleep and comfort even though that is clearly their strongest benefit. Waterbeds were originally invented for medicinal uses such as preventing bed sores for those who were bedridden for long periods of time, arthritis and for cribs used by premature babies. Hospitals today still use waterbeds not only for these reasons but because of their therapeutic value and the ability to control the bed’s temperature using a simple thermostat. Waterbeds still have a large ‘cult’ following. These are people who saw past the waterbed fad and realized that waterbeds are extremely therapeutic. For athletes and others who suffer from orthopedic problems, waterbeds can not be beaten in terms of value. The waterbed shapes exactly to the body, minimizing pressure around joints and the spine allowing the spinal functions to fully relax aiding in the comfort of those who complain of back problems. For those who suffer from allergies, it is impossible for dirt, dead skin and dust mites to penetrate waterbeds. Dust mites can cause asthma and eczema making waterbeds a great option for those concerned with their waterbed’s hygiene. Are Waterbeds Hard to Maintain? Despite the myth, waterbeds are actually really easy to maintain. Water only needs to be added when the bed is set up and if the bed is moved. 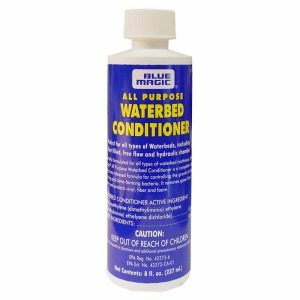 A waterbed conditioner, such as the Blue Magic All Purpose Waterbed Conditioner, is added once per year to prevent the growth of bacteria and to protect the vinyl mattress and foam. Blue Magic waterbed conditioner makes waterbeds easy to maintain. A hardside waterbed uses a traditional wooden box frame and does not contain any wave reducing material, allowing you to experience the full motion that the waterbed has to offer. However, some hardside waterbeds can still reduce the motion of the bed depending on what the preferred comfort level is. Softside waterbeds are often preferred over hardside mattresses because they appear to look just like a traditional mattress. They can fit into existing bedroom furniture, use standard sheets and do not need a wood frame in order for the mattress to keep its form. Softside waterbeds still retain their contouring and pressure free support while eliminating the wave sensation typically associated with traditional waterbeds. Softside waterbeds can also offer extended specialized support. Customers can choose specialized bladders to fit their needs or even choose a dual bladder systems to control the fill level of each side of the mattress allowing you and your partner to choose your own preferred comfort level. How do I Find the Right Waterbed? While most insurance policies cover waterbeds in the same category as electrical equipment that uses water it is important that a waterbed company offer a good lifetime warranty and free returns and exchanges. Online retailers allow waterbeds and waterbed care and accessories to be shipped straight from the manufacturer providing a huge discount for those who are worried about the price tag. It may be easy just to classify waterbeds as a mattress filled with water, but a good waterbed is so much more than that. The variety of bed designs make waterbeds the most versatile type of bed on the market. More than just hardside and softside, there are a ton of options for consumers. For a typical hardside waterbed, checkout Contura Waveless Hardside Waterbed. For a shallow fill softside waterbed, see the Juniper Softside Waterbed. 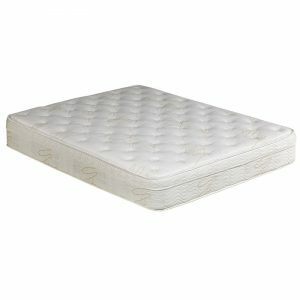 For a deep fill softside waterbed, see the Lily Deep Fill Softside Waterbed. For more information on deciding what waterbed, waterbed accessories and care products you may need, discounts and promotions, check back on the blog and follow us on Facebook and Twitter.